Luya is a root stock grown in many places in the Philippines, and is very common on Mt. Banahaw. Luya is one of our four “power herbs” having a long history and proof of being a very effective medicinal herb. 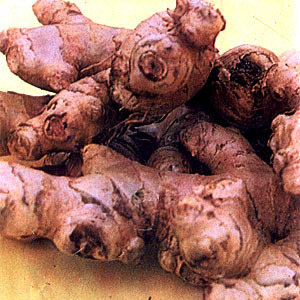 It is commonly used in treating colds and flu in children, because of it effectiveness and safety in large doses. Japanese researchers have found that Luya causes the heart to beat more strongly and slowly and that blood pressure lowers by 10 to 15 points after Luya is ingested. Indian researchers have found that Luya is also effective in removing cholesterol from both the blood and liver. Luya is also reported to sooth the stomach, helping digestion. It is reported to relive gas, flatulence, and cramping, and facilitate the breakdown of food in the stomach and the absorption of food in the small intestine. A number of researchers have found that Luya is highly effective in alleviating motion sickness, nausea, and vomiting, being more effective than Dramamine. Luya’s various isolated components also possess anti-inflammatory, antiviral, diuretic, antifungal, antiseptic, and antibiotic properties. It has been found effective in the treatment of heart disease, migraines, stroke, coughs, dizziness, fever, kidney stones, and viral infections. This entry was posted in List of Medicinal Plants in the Philippines on March 21, 2009 by Pinoy Herbs.